It’s a plane. It’s a rocket. It’s a CURE FOR DIABETES!!! I am late to this blog topic table, like really late, and quite frankly, I’m completely okay with that. You see, I am not as ingrained into the diabetes online community as maybe I should be. My blog roll isn’t bursting with diabetes-related blogs, just a handful really, and for the most part, I tune into the Twitterverse in peaks and valleys. And so, when the events of last week unfolded, with regards to a supposed major cure breakthrough, I was completely, totally, 100 per cent out of the loop. In fact, because my eyes and brain have been so focused on studying for my chemistry final (seriously, whoever thought that language up must have been on crack) I’ve even fallen behind on the blogs I do read, and so, it wasn’t until late last week that I was brought up to speed on this new revelation – The Biohub – which from what I can tell is some kind of spongy thing that mimics a pancreas. Ask me: Did I jump for joy? Did I go out looking for more information? Did I pull up the diabetes forums? Or start leaving comments of my own? Did I call my moms? Did I call Big Ring? Did my belly fill with excited butterflies and my fingers shake with joyful tingles? I’ve been down this road many times before, and honestly, my first thought, before even watching the video was “Here we go again.” Most of us in the DOC have similar stories: there will be a cure in 5 years, they told me; by the time you’re 16, you won’t be jabbing yourself with needles no more, they said; wait just five more years, they assured me, by the time you’re 21, you’ll finally be a real girl again with no weird disease following you around. Well folks, I am now 34. I stopped believing in a cure long before I hit 21. 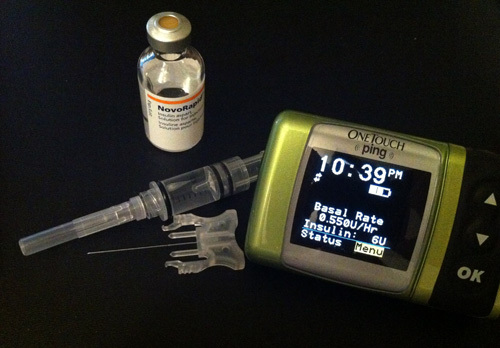 Diabetes is too much a cash cow for Big Pharma. Yep. I’m cynical. Can you blame me? This getup is not a cure, but it is the closest thing I’ve got to a pancreas. And after watching the Biohub video, I feel I’m pretty justified in my thoughts. Honestly, it was nothing more than a fundraising plea for something that, in its current state, is hardly more than just an idea. Nope. I won’t be holding my breath. Not for this one or the next one. This entry was posted in Diabetes, Uncategorized and tagged biohub, diabetes cure, diabetes false promises, diabetes online community, Diabetes Research Institute, Insulin pump, Type 1 diabetes. Bookmark the permalink.